The University of West Florida recently honored more than 250 students at the 28th annual Student Leadership Awards Banquet, hosted by the Division of Student Affairs. Students were recognized for various achievements, including completing thousands of hours of community service, managing millions of dollars in funding and embracing leadership roles that benefit campus life. The ceremony and dinner, held April 10 in the UWF Conference Center and Ballroom, featured alumnus and Pensacola City Council President Charles Bare as the keynote guest speaker. The division presented 14 awards, recognizing students for their leadership on campus, in the community and beyond. For a complete list of awards and recipients, see below. The Awards for Sustained Leadership and Service, named for two long-serving leaders in the University’s Division of Student Affairs, Linda O. Dye and Kenneth L. Curtis, recognize two seniors for their significant contributions, sustained leadership and service to campus life. Each award includes a $500 scholarship. Marissa Frangione received the Linda O. Dye Award, and Michael Krueger received the Kenneth L. Curtis Award. Frangione was honored for leadership in her sorority, Alpha Gamma Delta, and the College Panhellenic Council, as well as her work as a student admissions representative and Argo Camp leader. Krueger was acknowledged for his involvement with the Campus Activity Board, UWF MEN and Sigma Alpha Epsilon fraternity. He also interned with the Greater Pensacola Chamber of Commerce and the Pensacola Blue Wahoos. Dr. Kevin Bailey, vice president for student affairs, presented the inaugural Vice President’s Excellence Award to Chris Thrasher, the Student Government Association’s longest-serving senator and four-time chairperson of the Budget and Allocations Committee. During his tenure, Thrasher oversaw more than $14 million in distributions to students and their organizations and spent more than 5,000 hours completing his duties. Student Government Association President Daniel McBurney was recognized with the Hal Crosby Leadership Award. Named for the University’s founding president, the award honors a graduating senior whose sustained leadership and service to the campus and community leave a substantial and positive impact. Dr. Rebecca Kennedy, assistant vice president of student affairs and director of UWF Counseling and Psychological Services, awarded sophomore Kishane Patel with the Deborah L. Ford Emerging Leader Award. Named for a former vice president for student affairs, the award is presented annually to a freshman or sophomore who demonstrates a genuine commitment to the University, specifically in the area of student life. Patel serves as chief of staff for the Student Government Association’s president’s cabinet and as sponsorship chair for the Campus Activity Board. He also is an active member of UWF MEN. In 2016-17, Patel will serve as SGA Vice President. Zimmern recognized junior Brandon Robinson with the Outstanding Student Leader Award, given to a junior or senior who demonstrates a collegiate record of leadership and service to the University and campus life. Robinson serves as Senate president for the Student Government Association; president, Phi Beta Sigma Fraternity; public relations chair, African American Student Association; and involvement navigator, Student Involvement. Zimmern also presented Lori Lombardo with the Outstanding Graduate Student Leader Award, recognizing a collegiate record of leadership and service to UWF and the Pensacola community. 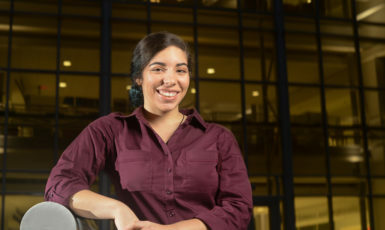 Lombardo serves as president of the Graduate Student Social Work Organization and traveled to Guatemala, where she presented on the American social work curriculum. University College Assistant Dean for High-Impact Learning Rachel Hendrix presented Angie Pinglo Briceno of Peru with the International Student Award for her efforts in welcoming international students and mentoring and tutoring her peers. Aisley Carter, compliance coordinator for Intercollegiate Athletics, awarded Student-Athlete Leadership Awards to men’s basketball player Justin Williams and women’s volleyball player Autumn Duyn. Williams, team co-captain and academic standout, led the Student-Athlete Advisory Committee as vice president and volunteered in the community and abroad. Duyn, the only player in program history to rank in the top two in both career digs and career kills, was the first player in program history to be named to the CoSIDA Academic All-America Team. Director of Recreation and Sports Services Bill Healey inducted students Davis Hagen and Sabrina Youngman into the Intramural Hall of Fame. Hagen competed in every intramural sport offered, winning three championships and accumulating a winning percentage of 65. Youngman earned a winning percentage of 79 and three championships. Healey also presented Erik Winfree with the Sport Club Leader of the Year Award for his work with the UWF Running Club. Connor Wagner received the William M. Healey Leadership Award, named for the recreation director, and was given a $500 scholarship. The award honors a recreational sports participant or employee who demonstrates leadership, sportsmanship and integrity while advancing the mission of Recreation and Sports Services. Fraternity and Sorority Life Coordinator Jessica Ryan presented the Fraternal Excellence Awards, designed to honor graduating seniors for exceptional leadership. Ryan honored Fran Adams of Phi Sigma Sigma; Allyse Rolle-Polk, Alpha Kappa Alpha; Marisa Palumbo, Kappa Delta; Kali Richardson, Alpha Phi Alpha; Kelly McMahon, Alpha Gamma Delta; Hector Constanzo, Sigma Alpha Mu; and Larry Antoine, Phi Beta Sigma. Dr. Ben Stubbs, associate director of university commons and student involvement, awarded Cannon Citations to Hakeem Douglas, Marisa Palumbo, Synthia Jean, Ruby Gregory, Ryan Lavoie and Cheyenne Biggerstaff. Inspired by alumnus Robert Annin, who retrieved the cannon that stands on the Pensacola campus’ Cannon Green from Pensacola Pass, the award recognizes significant student achievement and lasting impact. The program also recognized 126 students named among Who’s Who Among Students in American Universities and Colleges and 24 inductees of Omicron Delta Kappa, the National Leadership Honor Society. Collectively, students in these organizations recorded more than 7,500 hours of community service in 2015. Six groups received the Bronze Award for 200-499 hours of service; five received the Silver Award for 500-999 hours; and two received the Gold Award for more than 1,000 hours. 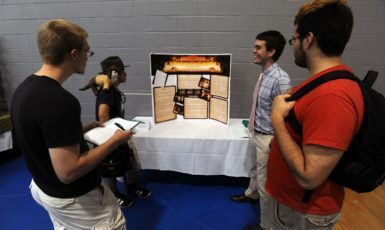 These organizations included eight chapters of the University’s Fraternity & Sorority Life community, the Kugelman Honors Program, and four academic- or interest-based student organizations. Students who completed 20 hours of service or more were recognized individually for their contributions. For more information about the Student Leadership Awards, visit uwf.edu/sla.